Hana, a hard-working college student, falls in love with a mysterious man who attends one of her classes though he is not an actual student. As it turns out, he is not truly human either. On a full moon night, he transforms, revealing that he is the last werewolf alive. Despite this, Hana's love remains strong, and the two ultimately decide to start a family. Hana gives birth to two healthy children—Ame, born during rainfall, and Yuki, born during snowfall—both possessing the ability to turn into wolves, a trait inherited from their father. All too soon, however, the sudden death of her lover devastates Hana's life, leaving her to raise a peculiar family completely on her own. The stress of raising her wild-natured children in a densely populated city, all while keeping their identity a secret, culminates in a decision to move to the countryside, where she hopes Ame and Yuki can live a life free from the judgments of society. 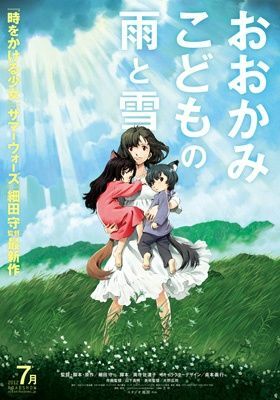 Wolf Children is the heartwarming story about the challenges of being a single mother in an unforgiving modern world.